Leaving candles burning on your concrete patio isn't a particularly dangerous practice, but if a candle drips or -- worse -- tips, the resulting stains can be troublesome. 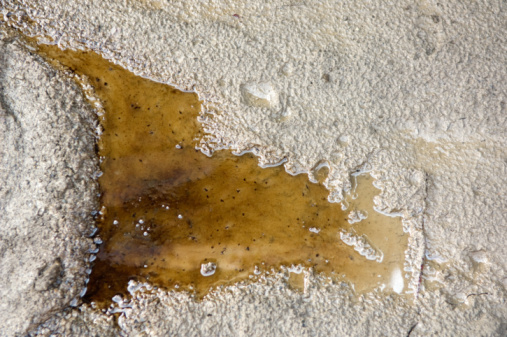 You can usually remove the bulk of the wax off by scraping, but a dark stain -- the result of molten wax soaking into the porous concrete -- often remains. In most cases, a simple mechanical procedure should remove it, and if that doesn't work, you have options that involve household cleaners. Cover the stain with a brown paper bag. Set a clothes iron to medium heat and let it warm up. Place it on the paper bag for about 10 seconds. Keep it moving to prevent the bag from overheating and igniting. Remove the iron, lift the bag and look at the other side. You should see a wet mark left by wax melted by the iron and absorbed by the paper. Repeat the procedure as many times as necessary. Scrubbing the wax with any of these ingredients should make a noticeable difference, particularly if you use very hot water, which softens the wax and helps it emulsify. A third strategy for removing wax stains from concrete is to make a poultice to draw the wax out. Use an alkaline cleaning powder, such as laundry detergent or baking soda. Make a paste, using water, and spread it on the stain. Try to confine it to the stain because it may draw some color out of the concrete that isn't stained. Cover the paste with plastic sheeting and tape the plastic down to prevent the paste from drying too quickly. Remove the plastic and clean the area when the paste has completely dried. After vacuuming it up, scrub with soap and water to remove any stain residue that remains.